Find Better Ideas, Faster ® with a custom desk trend report, our PRO Dashboard and 80+ categories of premium trend reports. 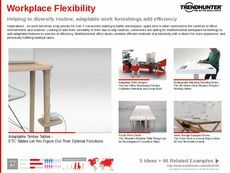 Office furniture is continuing to evolve in order to better cater to home offices, large business offices and student desks, which is why the Desk Trend Report uses crowdsourced research to better understand the needs and desires of those who work at desks. This report looks at large brands such as IKEA to see what large corporations are selling to consumers. 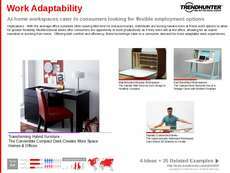 This report looks at the use of materials, styles, sizes and price ranges of desks. The report will also investigate how office furniture is taking on other roles, such as functioning as fitness equipment. This report is important for furniture supply retailers to use as a resource that will allow a better understanding of consumer demands. Desk and office furniture producers can use the report to develop a higher sense of awareness of what consumer want, while remaining current and informed about new designs and manufacturing techniques. When preparing to release a new desk or anticipating a new school and work year, the Desk Trend Report will allow you harness insights and broaden your knowledge.